I used to be a grammar snob. Since I was a high school English teacher, I felt it was my duty to correct errors in grammar wherever they could be found. Typos and flubs and linguistic faux pas caused me anguish. I addressed them like a firefighter rushing to a blaze. I would interrupt friends and family members to correct their pronoun case errors. I would email grammar lessons to my pastors. I would read newspapers with a red ink pen and mark articles like they were student essays. I am embarrassed by all of this now, but change didn’t take place overnight. Conviction and repentance came slowly for me, I admit, and I therefore strive to have patience with the still-emphatic grammar snobs all around me, but I must make an appeal to my fellow language-lovers. Stop being snooty. There’s a better way. 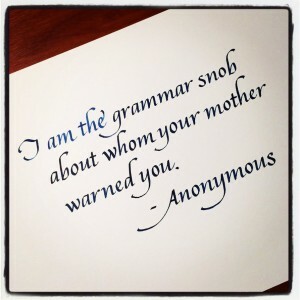 If you are an admitted grammar snob, I want to help you. I therefore present eight vital steps to becoming less irritable and less irritating. 1) Decide You Want to Change. This is the biggest hurdle. Most grammar snobs I know are not interested in changing. They are proud of their grammar snobbery. They are not even deterred by epithets as strong as Grammar Nazi. Somehow, they wear this starkly pejorative label like a badge of courage. Grammar snobs like to picture themselves as warriors against the decline of our language and culture. They see themselves as heroes trying to “maintain the status quo of our beautiful language,” as a recent Facebook commenter put it. But those around them don’t see it that way. Most people are just annoyed by self-appointed grammar cops. No one likes unasked-for correction. The less grammar-adept around us just feel condescended to and judged. Some are bothered and offended, others just feel stupid and ashamed. Judging people by their grammar is wrong. Correcting their grammar uninvited is worse. It’s just, very simply, rude. When someone attempts to communicate with you and you ignore what they are saying in order to correct how they say it, you are behaving shamefully. What could justify that kind of arrogance? Don’t say you can’t help it. Of course you can. But you have to decide you want to. 2) Realize that You Can Love English Without Being a Snob. I love English. I find words to be endlessly interesting. I’m fascinated by grammar, syntax, and etymology. And since I stopped being a snob, I’ve become still more interested in my language. And that has led me to further study and increased understanding. I’ve learned to listen attentively and avoid judgment when people speak in dialects and idioms that I’m not familiar with. I’ve become a much better student of the language since I stopped trying to be its arbiter. Grammar and linguistics can be even more fun when you break out of the trap of snobbery. 3) Embrace the Reality of Language Evolution. Centuries ago, Old English morphed into Middle English, which evolved into Modern English, which has never ceased to grow and mutate. The English of Dickens and Tennyson is vastly different from the English of Shakespeare and Marlowe. And the English of Hemingway and Faulkner is very unlike the English of Hawthorne and Poe. And despite the cries of critics, we have no shortage of brilliant writers today who create powerful art with the English of the early 21st century. Not only does language change, but critics have always objected to the changes and foretold the doom of English. Grammar snobbery is almost as old as grammar itself. And they have all proved to be false prophets. 4) Accept the Nature of Grammar Rules. Grammar rules exist. But there is widespread ignorance about where they come from. There is no officially sanctioned authority when it comes to English. And there never has been. Dictionaries, grammar books, and usage guides are not written by appointed authorities. They do not proclaim the official rules of correctness. Creators of such resources observe how the language is actually used by the majority, over time, and systematize it. They create descriptive, not prescriptive guides. These books are helpful because they tell us not how English should be used, but how it actually is being used. This is why they are so regularly updated. A favorite retort of grammar snobs is, “Just because a grammar error becomes common doesn’t make it right.” But of course it does! That’s exactly how grammar rules come to be. They don’t exist because scholars agree on what should be. They exist because we speakers and writers of the language collectively adopt habits and ways of communicating. As words and expressions and grammatical nuances become ingrained over time, they get recognized as correct by the various “authorities” of the language–mostly teachers and writers and editors. This means words and idioms that were originally erroneous become, in time, accepted. That’s one common way language evolves. It’s a sloppy system, sure. But it’s wonderfully organic and democratic. I’m so glad there is no government-appointed board to determine rules of spelling, grammar, and lexicography. Words arise as we need them–or simply like them. Others disappear because they are no longer useful or fall out of favor. Rules get abrogated because speakers find them too hard to remember. Errors become normalized and then cease to be considered erroneous. You might not like this. You might prefer stability and security when it comes to language. But that has never been and will never be the case. Language belongs to the people who speak it, not to experts or elitists. There’s no stemming the tide of linguistic change. I have found it wonderfully liberating to accept the fluidity and transience of English. I’m fascinated by slang, idiom, and wordplay. I’ve learned that some slang terms come and go (groovy, da bomb, cat’s pajamas) others have surprising staying power (cool, awesome, clueless). These things happen collectively and naturally in the fabulous free market of English. It’s okay to start sentences with and or but. It’s okay to split an infinitive. There are scores of these canards. They are not even evidence of change in the language. They are simply spurious rules derived from the opinions of obscure, centuries-old scholars that somehow took on the authority of gospel. This is the most ironic part of grammar snobbery: The snobs who claim intellectual superiority on grammatical matters are so often wrong. There are several well-written and well-researched resources that delve into these controversial issues. It’s not hard to find the truth with just a little Googling, but grammar snobs have a bad tendency to blindly cling to rules they were taught in their school days. This leads to the next step. 6) Be Willing to Learn. Another irony I’ve found is that the group least open to learning about language is English teachers. I don’t want paint with too broad a brush, but on they whole, they seem to be the most stubborn about grammar issues. I once spent considerable time debunking the “never start a sentence with and” rule. I pointed to dozens of web articles on the subject. I cited three well-regarded usage dictionaries and the OED showing that sentences have started with and from the earliest days of English, including those written by our greatest writers. I pointed out that the first chapter of the Bible includes thirty-nine sentences beginning with and. I used some web tools to show that and has been among the top five most common words to start sentences in print for decades. I also showed that the first scholars to oppose starting sentences with and were simply expressing opinion and not attempting to establish a universal rule. In short, I made what I considered an open and shut argument against a clearly spurious rule. All with the hope of setting us free. Most English speakers and writers start sentences with and regularly. Or want to. I wanted to give them official permission to write the way they feel comfortable. But I didn’t convince at least one English teacher. She made no case. She cited no research or authorities. She ignored my evidence. She simply said, in effect, “I have always taught not to start sentences with and, and I will continue to insist on it in my classroom no matter what you say.” She clearly saw me as a subversive trying to undo her many years of work ingraining the and rule in her children. Perhaps it was too hard to believe that she’d been teaching an unnecessary and imaginary rule all that time. I understand that. I just hoped that as a teacher, her commitment to intellectual integrity would win out. I still hope it will in time. Abandoning grammar snobbery doesn’t mean you have to abandon your language preferences. No one is insisting that you begin including the word irregardless in your daily speech. You just don’t have to correct others who do. If you like your Oxford comma, you can keep your Oxford comma. Feel free to refuse to use the singular their. The whole point is that the language doesn’t belong to any one of us or to any group of elites. That means you can feel free to detest particular slang terms and expressions. Don’t start sentences with and if you don’t prefer it. Avoid redundant prepositions if that’s where you are at. Have opinions and feel free to share them with interested parties. (Although, I don’t recommend it when you are at actual parties.) Just remember that they are opinions and not universal law. Acknowledge that others may have a different opinion on what effective and evocative language looks like. People use words in different ways. That doesn’t have to bother you. In fact, it can interest and entertain you. It’s all about your point of view. I can’t believe grammar snobs who regularly complain about other people’s use of English are as happy as they could be. That’s a shame. If for no other reason quit being a grammar snob because it will make you happier. Thank you for this excellent article. I appreciate that you emphasized how rude it can seem to others when we raise high our “Defender of the Language” shields. I love the English language, but never want my affection for it to be used carelessly as an unintended weapon against others. Thank you for being a good example to us by modeling a sincere appreciation for the often unexpected twists and turns that a constantly developing language takes. It’s a mindset change for me, but I desire to lay aside some of my previously clung-to armor and enjoy the journey as we all march together under the banner of our magnificent English language. Beautifully explained, Brian! I’m still a bit of a grammar Nazi re.dangling prepositions, which strike me as unnecessarily awkward, and I advise my students to rewrite the sentence, instead. But [note the conjunction starting this sentence] aside from that I agree 100%. I don’t think finding dangling prepositions “unnecessarily awkward” makes you a grammar Nazi. Finding them objectively wrong might. Like I said, opinions are fine. Thanks for the encouraging comment, Rhonda! Thank you from here in the UK Brian – eloquent. I teach business writing, and I have found that two perspectives really help people to grasp the reality about language. One is to give them examples where old rules have become discredited (“agenda” used to be a plural, “to contact” was seen as a barbaric verb-form of a noun, etc). The disbelief at these examples makes the point that seemingly rock-solid rules have changed, and will continue to change. We often cite the parallel changes in office etiquette – ties/no ties, anti-sexism etc – subtle, but important. The other is formality: business writing is a fairly formal context, and you are also writing on behalf of an organisation which wishes to be seen in a certain light. Presenting things as formal/informal as opposed to right/wrong helps people to feel less attacked or inadequate. A parallel to formality of writing is table manners – kids may behave one way in their peer-group round a campfire, but they need to know the rules for lunching with Grandma. Excellent, Andrew. I love and agree with your perspective. Thanks for taking the time to comment. Hah–sellout! What about “Me and Mabel are stepping out”? Would you swallow that? AAGH! Would I “swallow” it? What does that mean? If it means would I write or speak that way? No. Would I mark it as an error in a student paper? Yes. Would I judge someone who speaks this way as ignorant or uneducated? No. would I stop someone who says it to correct them? Of course not. Does it bother me to hear people speak this way? Not at all.